在傳統的 Server 主機在安裝完一種作業系統 (Windows , Linux …) ,就只能提供該作業系統所能提供的服務,我們無法在同一主機上同時提供 Windows 的服務又同時提供 Linux 的服務,或者其他作業系統的服務. 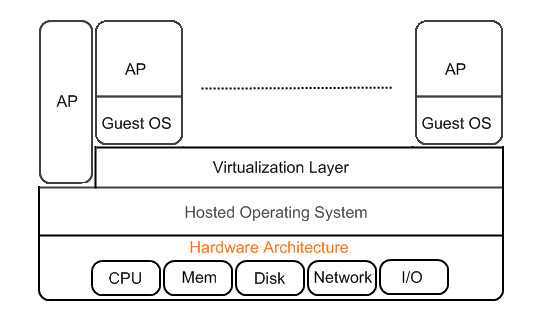 Full Virtualization 使用的是 – Binary Translation. 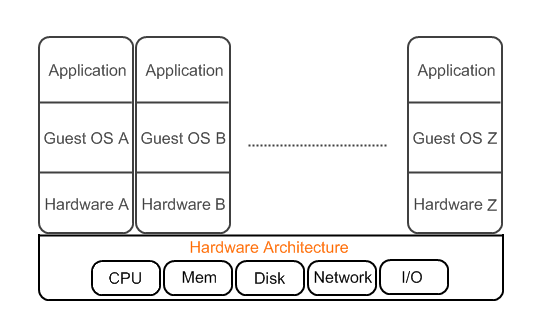 Hardware-assisted virtualization 這也是最新的方式需要有硬體(CPU) 的支援 – Intel VT 或者 AMD-V.
Application-Level Virtualization 可直接用於原作業系統上 ,不需要 VT 或是額外的硬體來支援. 目前虛擬化的產品基本上可以區分為兩大類,第一類是企業用全虛擬化環境 如 Full Virtualization 或是 Paravirtualization 這一類,這一類的有 VMware ESX 或是 XenServer.至於另外一類為 Application-Level Virtualization ,適用於學生或是其他非以效能為優先考量的工作環境,轉言之就是可以在原先的 Windows 系統下使用 Linux 或是其他非 Windows 系統,這一類比較具代表性的像是 VMware Server 等的產品. 在 Intel x86 系統架構下為了保護指令的運行,提供了 4 種不同 Privilege 特權級別的指令.也就是俗稱的 Ring,可以區分成為 Ring 0,Ring 1,Ring 2 和 Ring 3.Ring 0 擁有最高的權限,通常是由系統核心才會有 Ring0 的權限,Ring 0 可以直接和硬體溝通讀取 IO,CPU,Memory 與周邊裝置.其次是 Ring 1,以此類推.一般 Kernel,driver 會存在 Ring 0.一般 AP 存在 Ring 3,一般的作業系統也只運用到 Ring 0 和 Ring3.採取這種方式的優點是一般運行的程式沒有辦法直接與硬體溝通,所以不會有像 Window 3.1 時一樣的狀況發生,一個程式就能把整個系統摧毀(Crash)掉. 這一類的虛擬化,比較像是藉由應用程式虛擬出來一個與現行完全不同的硬體環境.像是一些可以在 PC 環境上模擬出來的遊戲機之類的,或是透過虛擬的硬體環境去模擬 smart phones 以及 PDAs .可以提供給程式開發者在 PC 的環境下開發出 smart phones 或是 PDAs 的應用程式. 這樣的缺點是會造成效率的低落,但好處是虛擬出來的作業系統(Guest OS)並不知道有 VMM 的存在,他會以為自己擁有整個機器,而且虛擬出來的作業系統(Guest OS)也不需要修改核心去配合 VMM.加上 VMM 會管控整個主機包括了虛擬化的 BIOS,devices 和 memory,而且每一個虛擬出來的作業系統(Guest OS)都是獨立而且安全性高不會受到其他虛擬出來的作業系統(Guest OS)影響. 目前採用這種方式的有 IBM System/370, VirtualBox, VMware Workstation (32-bit guests)以及 Microsoft Virtual PC. 剛才有說明為什麼在一般 x86 系統下沒有辦法做虛擬化,大部分的原因是不能虛擬化的指令(nonvirtualizable instructions)必須直接在 Ring 0 執行.但是 Paravirtualization 使用了另一種方式,修改虛擬化作業系統(Guest OS)的核心,讓虛擬的作業系統(Guest OS)可以直接將不能虛擬化的指令(nonvirtualizable instructions)自動轉換成 VMM 可以執行的指令(hypercall),再由 VMM 去向硬體提出請求.目前像是 Linux 或是 FreeBSD 都可以透過修改核心去支援這項技術但是像是 Windows 的系統不能去修改它的核心(Microsoft 也不願意讓別人來修改它的核心),所以無緣使用 Paravirtualization.而所謂的 hypercall 就像是 OS kernel 的 syscall 只不過 hypercall 是針對 hypvisor(VMM)的. 目前採用這種方式的有 XenSource 以及 GNU/Linux distributors(RHEL 5 和 SLES10 以上的版本). 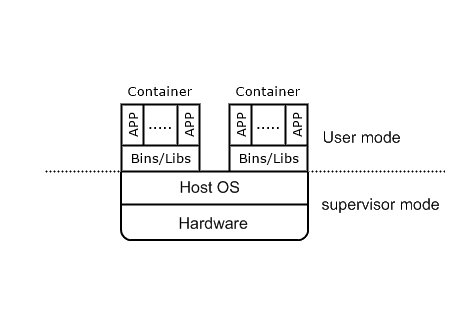 在沒有 VT 的時代 VMM 是直接載入在 Ring 0 裡面,Dom0 的 kernel 則是被放在 Ring1(Dom0 是第一個在 Xen 底下運行的虛擬機器).後來產生出的 DomU 也是存放在 Ring1(需為 Para-Virtualized,沒有 VT 的支援 Xen 不支援 full-Virtualized).不過一般的 AP 還是運行在 Ring 3.也正因為如此 Para-Mode 的 Guest OS 必須知道 VMM 的存在.此時是不支援 Full-Mode 的. 後來有了 VT 這一項技術.VMM 和 Guest OS(Para/Full-Mode)都可以直接執行在 Ring0 運行.不過 VMM 是存在比 Guest OS 還要低的一層.Root Mode Privilege Levels.不能虛擬化的指令 (nonvirtualizable instructions)會自動被 hypervisor 截取不需要再經過 binary translation 或 paravirtualization 的模式轉換. 目前 Intel 推出含有 VT 的技術包括了下面幾項. 目前 Intel 推出的 CPU 並未包過下面這項,這是未來 Intel 將計畫推出的. 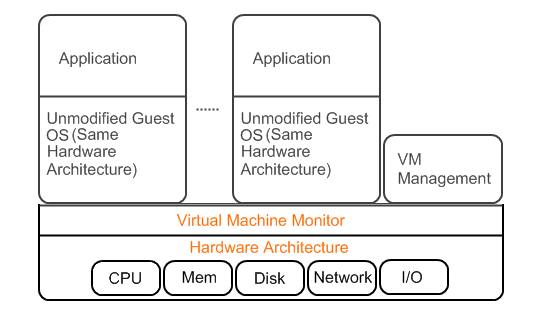 Hardware-assisted virtualization 在不同的平台上有著不同的名稱,比如你在 Xen 這種技術被稱為 hardware virtual machine (HVM), Virtual Iron 稱他為 native virtualization. 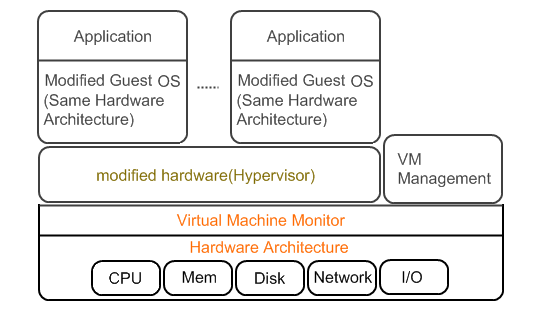 目前採用這種方式的有 VMware Workstation (64-bit guests only), Xen 3.x , Virtual Iron, Linux KVM 以及 Microsoft Hyper-V.
還有一種是 Application-Level Virtualization 他是架構在其他作業系統上的,像是 VMware Server 它的架構很簡單,它只是一個作業系統下的一個應用程式,優點是它不需要 VT 或是額外的硬體來支援,但相對的缺點就是他的效能相對的不佳.它提供一個全虛擬化的架構虛擬出來的作業系統幾乎都可以包括,像是 Windows, Linux ,Netware 都有支援,如果你沒有特別的需求可以考慮這一類的虛擬化方式.它像是其他虛擬化的環境為每個虛擬出來的 Guest OS 提供了獨立不受其他的 Guest OS 影響的獨立環境,但整體是你的最原始的作業系統沒有被破壞.做出來的 Guest OS 還可以輕易的移到不同的機台下繼續使用.